The imagined community is a concept coined by Benedict Anderson which states that a nation is a community socially constructed, which is to say imagined by the people who perceive themselves as part of that group. 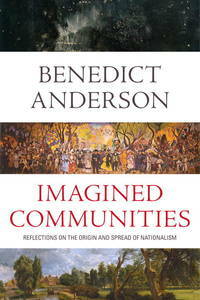 Anderson's book, Imagined Communities, in which he explains the concept in depth, was published in 1983. 2012-03-05. New. Ships with Tracking Number! INTERNATIONAL WORLDWIDE Shipping available. Buy with confidence, excellent customer service! 2012-03-08. New. Ships with Tracking Number! INTERNATIONAL WORLDWIDE Shipping available. Buy with confidence, excellent customer service! 1998-05-06. New. Ships with Tracking Number! INTERNATIONAL WORLDWIDE Shipping available. Buy with confidence, excellent customer service! 2012-03-05. Good. Ships with Tracking Number! INTERNATIONAL WORLDWIDE Shipping available. May not contain Access Codes or Supplements. May be ex-library. Shipping & Handling by region. Buy with confidence, excellent customer service! 2016-03-05. New. Ships with Tracking Number! INTERNATIONAL WORLDWIDE Shipping available. Buy with confidence, excellent customer service! 1993-07-08. Good. Ships with Tracking Number! INTERNATIONAL WORLDWIDE Shipping available. May not contain Access Codes or Supplements. May be ex-library. Shipping & Handling by region. Buy with confidence, excellent customer service! 2012-03-08. Good. Ships with Tracking Number! INTERNATIONAL WORLDWIDE Shipping available. May not contain Access Codes or Supplements. May be ex-library. Shipping & Handling by region. Buy with confidence, excellent customer service! Analytical Psychology Club of San Francisco, Incorporated, 1983. Hardcover. Good. Disclaimer:A copy that has been read, but remains in clean condition. All pages are intact, and the cover is intact. The spine may show signs of wear. Pages can include limited notes and highlighting, and the copy can include previous owner inscriptions. At ThriftBooks, our motto is: Read More, Spend Less.Dust jacket quality is not guaranteed. Verso. PAPERBACK. 0860917592 New Condition. . New. 1993. Verso. PAPERBACK. 1784786756 New Condition. . New. Verso. PAPERBACK. 1844670864 New Condition. . New. Verso, 1998-05-01. Revised. Paperback. Used:Good. Verso, 2016-09-13. Paperback. new. black & white illustrations. The world-famous work on the origins and development of nationalismThe full magnitude of Benedict Anderson?s intellectual achievement is still being appreciated and debated. Imagined Communities remains the most influential book on the origins of nationalism, filling the vacuum that previously existed in the traditions of Western thought. Cited more often than any other single English-language work in the human sciences, it is read around the world in more than thirty translations.Written with exemplary clarity, this illuminating study traces the emergence of community as an idea to South America, rather than to nineteenth-century Europe. Later, this sense of belonging was formed and reformulated at every level, from high politics to popular culture, through print, literature, maps and museums. Following the rise and conflict of nations and the decline of empires, Anderson draws on examples from South East Asia, Latin America and Europe?s recent past to show how nationalism shaped the modern world. 2016-03-05. Good. Ships with Tracking Number! INTERNATIONAL WORLDWIDE Shipping available. May not contain Access Codes or Supplements. May be ex-library. Shipping & Handling by region. Buy with confidence, excellent customer service! VERSO. New. 8.38 x 5.59 cm. 1998-05-06. Good. Ships with Tracking Number! INTERNATIONAL WORLDWIDE Shipping available. May not contain Access Codes or Supplements. May be ex-library. Shipping & Handling by region. Buy with confidence, excellent customer service! 2006-02-03. Good. Ships with Tracking Number! INTERNATIONAL WORLDWIDE Shipping available. May not contain Access Codes or Supplements. May be ex-library. Shipping & Handling by region. Buy with confidence, excellent customer service! Verso. PAPERBACK. 1784786756 Like New Condition. . Fine. Verso. PAPERBACK. 0860917592 Like New Condition. . Fine. 1993. Tantor Audio. MP3 CD. 1452656339 Special order direct from the distributor . New. Verso. PAPERBACK. 1844670864 Like New Condition. . Fine. Verso, 2016 Book. New. Paperback. New and in stock. Verso. PAPERBACK. 1784786756 Brand New ,Original Book , Direct from Source , Express 5-8 Business days worldwide Delivery. . New. Verso, 2006-11-17. New Edition. Paperback. Used:Good. Verso. PAPERBACK. 1784786756 Special order direct from the distributor . New. Verso, 1990-01-01. Paperback. Good. SCARCE SOFTCOVER BOOK. SOME WRITING IN MARGIN & SOME UNDERINING MARKINGS IN TEXT. SHARPEY MARKING ON FIRST PAGE. LIGHT WEAR & SCUFFING TO COVER. A CLEAN & SOLID BOOK. Verso. PAPERBACK. 1784786756 . New. Verso. PAPERBACK. 1784786756 Remainder mark . Fine. NY: Verso. Good+. 2006. Revised Edition. Softcover. One page is creased at the top corner - very lightly used, unmarked. ; 8vo 8" - 9" tall; 240 pages . London New York, Veso, (2006).. Revised Edition; 8vo; pp. xv, 240; bibliography, index; stiff wrapper; bookplate; a fine copy. At the time this book on nationalism forged a new field of study when it first appeared in 1983. The author elaborates on the core question: What makes people live and die for nations, as well as hate and kill in their name? Routledge, 1991. Hardcover. Acceptable. Disclaimer:A readable copy. All pages are intact, and the cover is intact. Pages can include considerable notes-in pen or highlighter-but the notes cannot obscure the text. At ThriftBooks, our motto is: Read More, Spend Less.Dust jacket quality is not guaranteed. Verso. PAPERBACK. 1784786756 *LIKE NEW* Ships Same Day or Next! . Fine. Verso. PAPERBACK. 1784786756 *BRAND NEW* Ships Same Day or Next! . New. U.S.A.: Verso, 1998. very good trade paperback. 1998. Back cover has blemish. Some underlining.. Trade Paperback. Very Good. Verso. PAPERBACK. 1844670864 *LIKE NEW* Ships Same Day or Next! . Fine. Verso. PAPERBACK. 1844670864 *BRAND NEW* Ships Same Day or Next! . New. Verso. PAPERBACK. 1784786756 Brand New! Not overstocks or remainder copy! . New.